Home » Animals » Horses » Moxidectin dewormer for horses – watch that dosage! With its long residual effect, moxidectin dewormer is a useful treatment for encysted small strongyles and all stages of brown stomach worm in horses. But it can be toxic if the wrong dose is administered, warns Dr Mac. 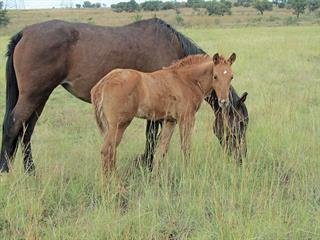 Mares and foals grazing green grass during the rainy season can easily be infected with small strongyles. Moxidectin is a deworming remedy for horses that belongs to the group of second-generation macrocytic lactones. It has a broad spectrum against most roundworms as well as bots. It is also particularly effective against encysted small strongyles and all stages of brown stomach worm in horses. It can be toxic, however, if applied at the wrong dose. Moxidectin was first used in 1989 as an injectable dewormer in cattle; later it was used in sheep and deer. 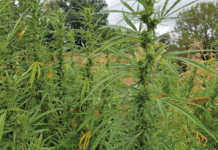 It has subsequently been used for the control of heartworm in dogs. In South Africa it is available as an oral gel in a calibrated syringe for deworming horses (Pfizer Equest). Moxidectin’s chemical formulation is slightly different to Ivermectin, well known here as a horse and livestock deworming remedy. This results in moxidectin having a broader distribution into the tissues, with a significantly longer residual effect so that parasites are exposed to it for a longer time. It is unwise to use any deworming programme in horses without first determining the species of worm present. Usually, a vet will examine a sample of manure from each of the horses in a stable every two to three months to determine the number of worm eggs per gram. This is a direct measure of the number and type of adult worms in the horse’s intestines. Worm burdens are seasonal as each worm species has a different life cycle. Brown stomach worm, for example, usually occurs in late summer, when biting flies become a nuisance, as the worm is carried by the fly Stomoxys calcitrans. Small strongyles or ‘redworms’, including Cyathostomum spp, Cylicocyclus spp, Cylicodontophorus spp, Cylicostephanus spp and Gyalocephalus spp, often mature within a few weeks of the first heavy rains. This coincides with the breeding season and they move into the mare’s intestines shortly before or after the birth of a foal. Moxidectin is the only remedy that is effective against the encysted form of small strongyles. strongyles are a problem, moxidectin is the remedy of choice. The drug has also been proven to be effective for 12 weeks, longer than most other dewormers. Preferably the entire herd, excluding young foals and pregnant mares, should be treated at the same time. However, moxidectin should be used as part of a programme and not exclusively throughout the year. All medications can cause adverse reactions if given in the incorrect dose. It is essential to estimate the weight of a horse accurately and use the appropriate amount of dewormer. This precaution is particularly important with moxidectin, as an overdose, especially in very young horses, those in poor condition or pregnant mares, can poison the animals. To assist horse owners, the weight of the horse is written on the plunger of the syringe used for dosing the medication. 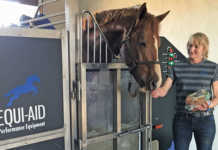 If a scale is not available, a horse’s weight can be estimated by measuring its body using a specially graduated tape. A horse’s breed and condition score influence its bodyweight, so a visual inspection can produce only an estimation of the weight. In general, a mature warmblood weighs between 500kg and 600kg, a Thoroughbred between 400kg and 500kg and an Arabian about 350kg. 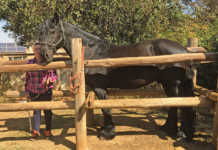 A Welsh mountain pony tips the scales at approximately 150kg.